Habit: Perennial herb, mat-forming, 2--20 cm, densely glandular-hairy, +- green; taproot > 3 mm diam; rhizomes, trailing stems < 60+ cm. Stem: in flower ascending to erect. Leaf: 5--12(15) mm, +- 0.3--1.1 mm wide, > internodes, needle-like to awl-shaped, straight to recurved, +- rigid, +- evenly spaced; axillary leaves well developed. Flower: sepals 3.5--7 mm, acute to acuminate, margin not incurved, ribs 1 or 3; petals 0.7--1.6 × sepals. Seed: 1.5--2.2 mm; margin thick, red-brown to dark brown. Chromosomes: 2n=36. Note: 1 other variety, extending sp. range to British Columbia, Alberta. Minuartia nuttallii var. gracilis (B.L. Rob.) Rabeler & R.L. Hartm. Leaf: straight or +- recurved. Flower: sepal ribs 1 or 3, lateral pair 0 or less prominent; petals 0.7--0.9 × sepals. 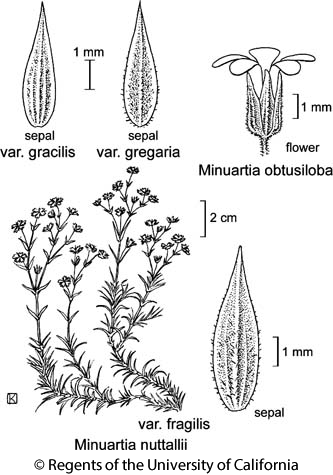 Synonyms: Minuartia nuttallii subsp. gracilis (B.L. Rob.) McNeill; Arenaria nuttallii Pax subsp. gracilis (B.L. Rob.) Maguire; Arenaria nuttallii var. gracilis B.L. Rob. Citation for this treatment: Ronald L. Hartman & Richard K. Rabeler 2012, Minuartia nuttallii var. gracilis, in Jepson Flora Project (eds.) Jepson eFlora, http://ucjeps.berkeley.edu/eflora/eflora_display.php?tid=81389, accessed on April 19, 2019. KR, CaRH, SNH, SnGb, SNE; Markers link to CCH specimen records. Yellow markers indicate records that may provide evidence for eFlora range revision or may have georeferencing or identification issues. Purple markers indicate specimens collected from a garden, greenhouse, or other non-wild location.